Several weeks ago I went down to my sister’s house so she could babysit me through some craft project (she’s amazing at crafty things). For lunch she had made this amazing Italian Wedding Soup, which I immediately fell in-love with. I have made this twice since and am more in-love every time. The fresh flavors from the veggies, mixed with the Italian Sausage meatballs is just amazing. Be warned, this is a chopping-intensive soup. If you have a food processor that can chop everything for you I suggest you use it. *Mini shells or Ditalini works well, Orzo is too small, actual noodles are a bit too large. Chop all veggies. Mix up meatballs, I just used my hands. Heat olive oil in large stock pot, saute onion and garlic until soft, add carrots and celery and saute another few minutes. With wet hands, start forming meatballs while the veggies are cooking, make them small–about 3/4″ across. Add chicken stock and milk to veggies and bring to a boil. 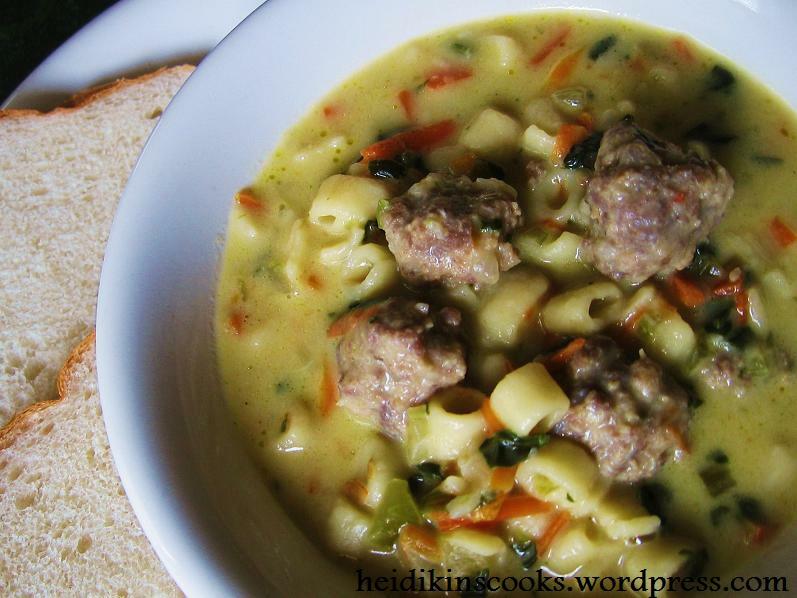 Drop meatballs into boiling soup, add pasta, let boil about 8 minutes and reduce heat. Let simmer 10-15 minutes. Add spinach, and when the spinach is wilty the soup is done. Garnish with Parmesan cheese. That picture sold me. Wow that looks amazing. I made this tonight for dinner and it was a huge hit with my parents.